Since last we had cause to wave a flag and celebrate what has been a shockingly happy awards season for Hope&Glory we’ve scored another couple of wins. First of all a handful of us trooped out to the Digital Impact Awards to do battle against the likes of LBi, AMV and AKQA – they really have upped their game in the quality of entrants. It was therefore with considerable pride that we took Gold for our O2 Travel “Gone Roamin'” campaign in the Best Tech and Telecomms category. We also bagged a Bronze for the same campaign in Best Use of Community Development while Meantime “Hops in a Box” also got a Bronze. Cracking night had by all. Then last week we headed off to the PRCA Awards 2013 in a broad variety of interpretations of black tie. 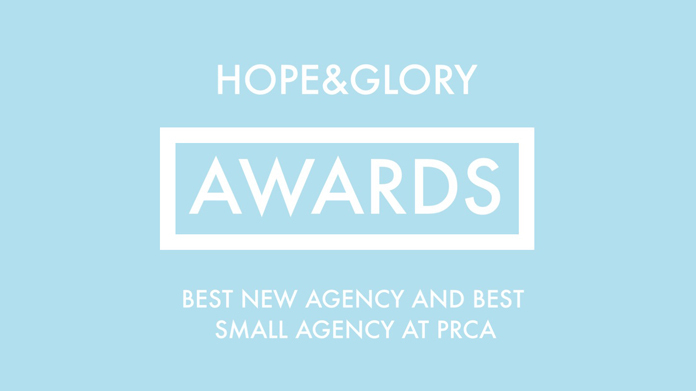 After what had seemed an interminable period of time we found ourselves called to the stage to take the award for Best New Agency. Which we were pretty startled by. But (as if that wasn’t enough), before we’d had chance to get back to our seats we found ourselves getting the nod for a second time as we won Best Small Agency as well. Not one but two awards. Amazing. As ever, it’s massive congrats to the whole team of wonderful people who make up Hope&Glory and huge thanks to all the wonderful people who have helped us get so far.